[PDF] Introduction to Materials Management (7th Edition) | Free eBooks Download - EBOOKEE! Description: For all courses in Materials Management, Production, Inventory Control, and Logistics taught in business and industrial technology departments of community colleges, four-year colleges, and universities. 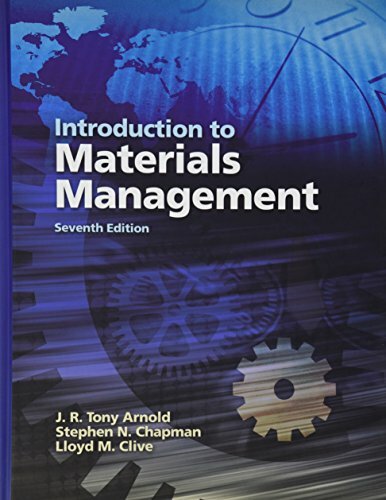 Introduction to Materials Management, Seventh Edition covers all the essentials of modern supply chain management, manufacturing planning and control systems, purchasing, and physical distribution. Clearly written and exceptionally user-friendly, its content, examples, questions, and problems lead students step-by-step to mastery. This editionâ€™s extensive updates include: new techniques, technology, and case studies reorganized and expanded coverage of lean production and JIT manufacturing new information on sustainability and â€œgreenâ€ production use of INCOTERMS for global supply chains revised end-of-chapter problems, and more. Widely adopted by colleges and universities worldwide, this is the only APICS-listed reference text for the Basics of Supply Chain Management (BSCM) CPIM certification examination. No comments for "[PDF] Introduction to Materials Management (7th Edition)".